German National Academy of Sciences Leopoldina recently published a new statement “Bioenergy – chances and limits“. It concludes that in quantitative terms, bioenergy plays a minor role in the transition to renewable, sustainable energy sources in Germany at the present time and probably in the future. Bioenergy requires more surface area, is associated with higher greenhouse gas emissions and is more harmful to the environment than other renewable sources such as photovoltaic, solar thermal energy and wind energy. 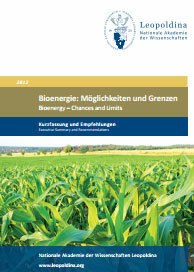 The Leopoldina’s statement “Bioenergy – Chances and Limits” provides a comprehensive analysis of the use of bioenergy. It was compiled by a working group of more than 20 expert scientists established in 2010 and outlines under which conditions the utilization of bioenergy is appropriate. Log in | 85 queries. 0.965 seconds.